Bossam is a type of ssam in Korean cuisine in which steamed pork is wrapped in a leaf vegetable such as red lettuce or sesame leaf, often accompanied by a condiment known as ssamjang. It is usually topped with raw or cooked garlic, onion, pepper, or, most commonly, sweet kimchi. Bossam is also preferred to be eaten with saeujeot (pickled fermented shrimp). 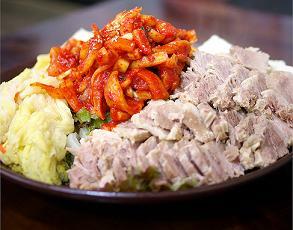 Bossam is a popular dish in Korea, and can also be served as an anju (side dish consumed while drinking soju).